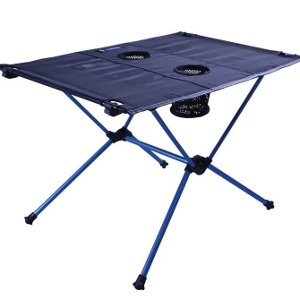 Ingeniously designed, this rugged and sturdy little table provides an extra level of backcountry enjoyment and comfort at camp time — with minimal effect on your pack weight. 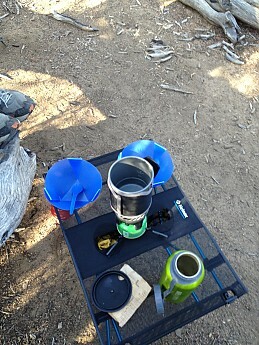 Works well as an elevated platform for canister stoves as well. 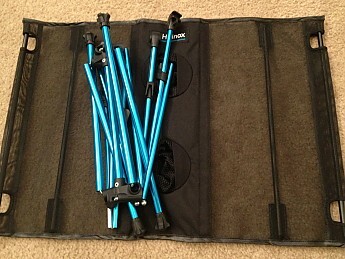 Setup and take-down are a cinch and the table stows in a fully daisy-chained soft case for versatile packing. 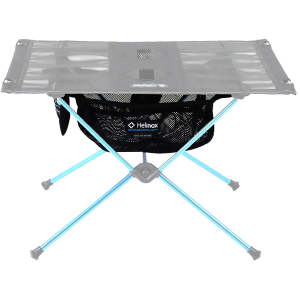 Although built well for two in the backcountry and optimized for Helinox chairs, this versatile table works well with or without other similar chair systems and is ideal where a quick and portable table is needed. 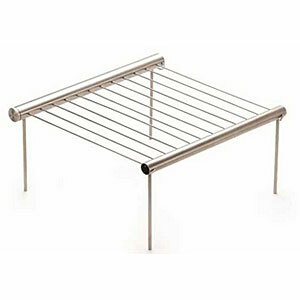 This is a well-built item, with quality construction, not surprising considering it's DAC's design and materials. The DAC hubs and poles are perfectly integrated. Assembly is easy thanks to the hubs and Jake's Foot style mounts between legs and table top. I've assembled it 20 times at least, and have never had a problem with it. Kids have assembled it as well, without directions. It is intuitive. It takes about 20-30 seconds to set up and about 1 minute to take down and roll up for packing. 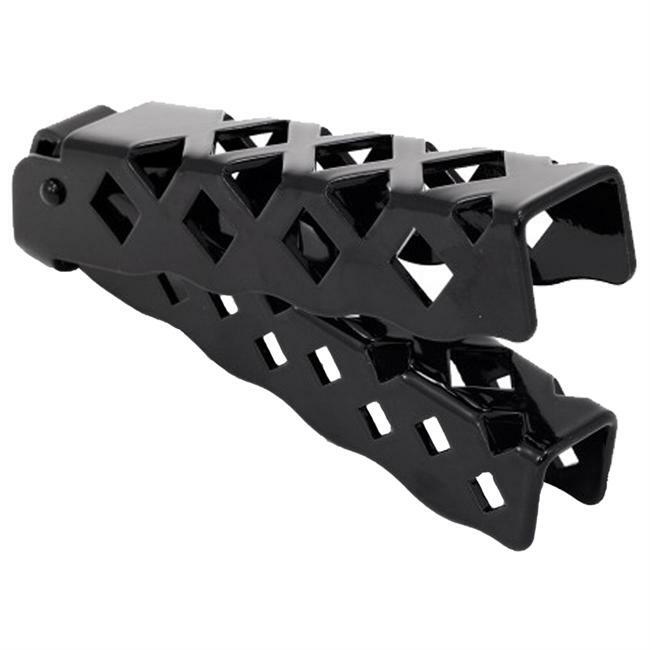 Shock-corded frame structure all but assembles itself. 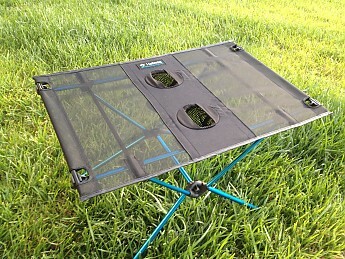 In two backpacking trips and seven family activities including 4th of July picnics, dance competitions, kid's sleepovers, beach camping, and beach days, everyone wanted to use the table while sitting on the ground or in a beach-style chair (low to the ground). Kids used it inside their forts for meals and card games, on the beach sifting through sand for small seashells and rocks, and once at home for a TV dinner to watch a movie. Whether at the beach or deep in the dusty SoCal backcountry, it is truly nice to elevate food and drink above the ground, keeping things cleaner and less contaminated. I don't like sand or dust on my food or utensils/bowls. 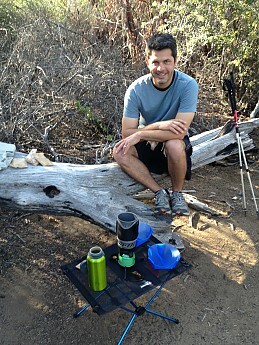 The table makes many places in the backcountry more useable as a dining area. Now I don't have to spend time trying to find a clean, flat surface at which to set up my kitchen and prep area. 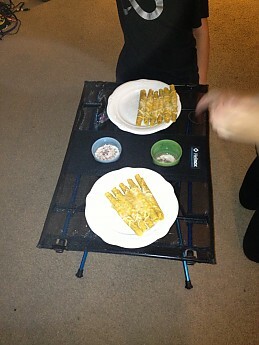 I can set the table up almost anywhere and have a clean, stable area for numerous tasks. The Table One functions well as a flat surface for a canister stove, as you can see in the picture below, but I wouldn't recommend using it as a base for remote canister or multifuel stoves, as the heat from those may melt or damage the mesh table surface. cleaning up spills on the mesh surface is a rinse process, not a wipe-off process, so keep that in mind. 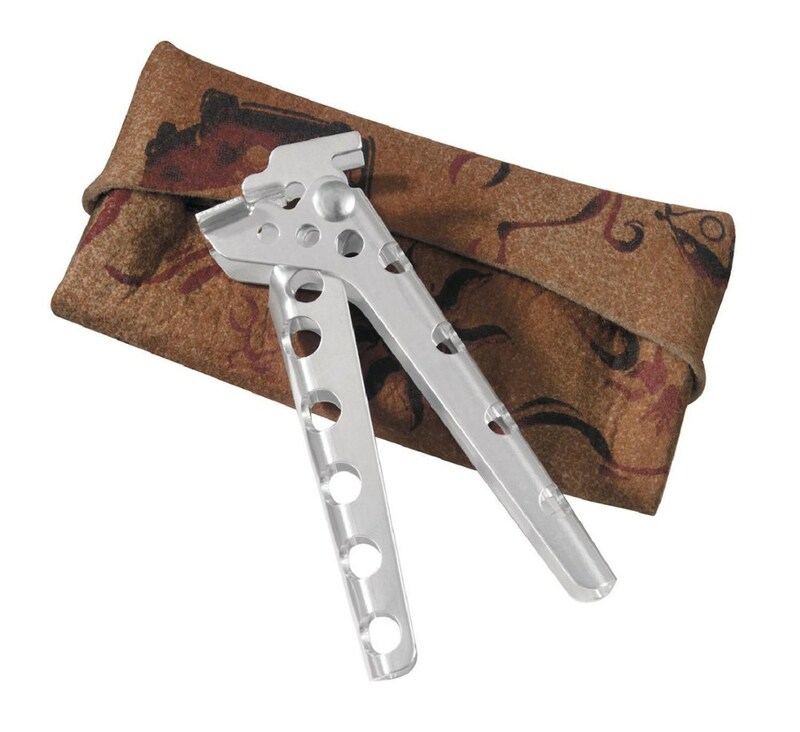 The well-designed feet, with stubby molars around the edge, mean a good surface for stable footing. They are also rounded in a manner which make them safe for use inside a tent. The table is light, 21 ounces packed in its case. Only GSI has a competitive table that is a half pound heavier and is only a few inches off the ground. 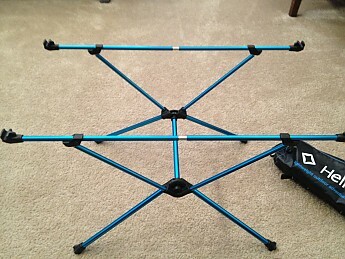 this table is 15 3/4" off the ground, which is likely optimized for Helinox's own Chair One (seated at 14" above the ground), using the same robust construction techniques. I found that sitting in my Thermarest Compakt chair, which is directly on the ground, still worked well in terms of position relative to the table top. I also sat on my portable camp stool, elevated about 13 1/2", and found that to be comfortable as well. I do wish there was one height adjustment depending on seating arrangements and size of the user. Cupholders are a great feature, with an elastic cuff for securing drinks, although I'd be leery of putting hot metal cups of coffee in them (the melting thing again). While I can fit a 700 ml Nathan sip-straw bottle in the holders, my 1 liter Nalgenes and equivalents do not fit. 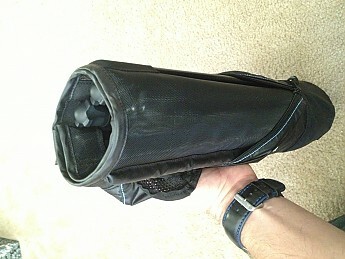 The carrying case has a daisy chain down its entire length, allowing one to mount it to practically anything: a backpack, a beach chair, a bike, a motorcycle, raft, or kayak. Here I will mention that with essentially the same frame, the Chair One is rated for people up to 320 pounds! While I only put 10 pounds of stuff on the Table One with no signs of stress, it's same basic frame as the chair means it's built to take a lot of weight. Update: I placed a 25 pound weight on the table and the table supported it with virtually no stress. I will conduct more stress tests in the future. The DAC poles are their strongest "Green" anodized variety, and look beautiful in the azure finish. I didn't find any stitches out of place, and the DAC poles mount securely in the detents the frame hubs. The mesh surface is strong as well. I will give a long-term assessment of durability down the road, but initial quality is top notch, which it should be for the retail price of $89. Lightweight gear costs more, yes, and this is a high quality piece which functions well, but it is a luxury item IF you are only considering its use for the backcountry. 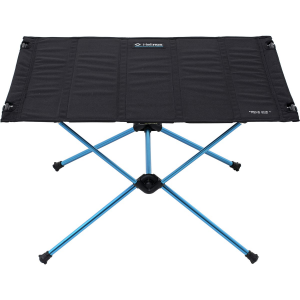 It is a great backpacking table, but what justifies the premium cost is the impressive design and versatility to use it just about anywhere. My kids want to use it all of the time — everywhere. 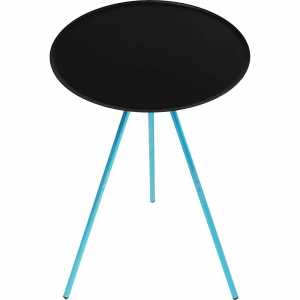 For that reason alone I can argue that for a backpacking and active family, the Table One graduates from being a luxury item to a travel necessity. 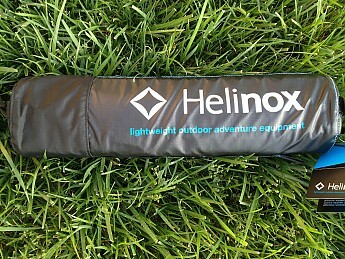 I'd like to thank Big Agnes/Helinox for sending me the Table One for evaluation.